South Korean tech giant Samsung has revealed its latest premium ultrabook, the Samsung ATIV Book 9 2014, a follow up to the Samsung ATIV Book 9 Plus. This new ATIV Book 9 keeps the slim dimensions of its predecessor but steps up to the plate with much improved features in the form of an upgraded display, revamped audio and a new keyboard design. The chassis of the Book 9 Plus 2014 measures in at just 0.63 inches thick, with a weight of 3.92lbs. It's instantly recognisable as a member of the Book 9 family thanks to the same aerodynamic curves along its body. The screen on the Book 9 Plus 2014 has seen an increase to 15.6 inches, improving on an already impressive display. Like the previous model, the screen is full HD and has 10-point capacitive touch, coupling well with the model's built-in Windows 8. A choice of Core i5 or i7 ULV CPU can sit under the hood powering the ultrabook's screen. The i5 Book 9 will have a 128GB SSD, while the i7 version doubles capacity to a 256GB SSD. Additionally, a 720p HD webcam adds to an impressive array of interactivity with an improved backlit keyboard. Samsung has also revamped the audio. The new Book 9 2014 Edition features a Wolfson digital-to-analog chip for better sound and recording, which Samsung claims offers better than CD-quality sound when used to play FLAC files. The laptop also comes with S Player+ pre-installed, which also offers improved compatibility with Samsung Hub, an audio streaming service that Samsung will be launching sometime this year. The new service will join a few others already available in offering lossless audio streaming. Samsung has improved battery life on the new model too. Usage of the ultrabook has been extended to 14 hours, a 40% increase on the 2013 model. 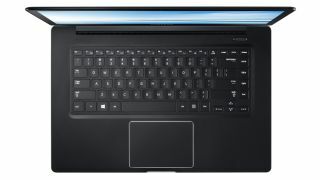 Connectivity-wise, the ATIV Book 9 Plus 2014 features two USB 3.0 ports and one USB 2.0 port, as well as HDMI and mini VGA display ports. As yet there is no information in pricing and availability.